Do mirror neurons explain understanding, or is it the other way round? A draft of this post has been sitting around for a few weeks, and while I’m happy with today’s sanity check, I still can’t help but suspect that I am missing something in the debate on “action understanding”. So I am happy to be convinced that I have completely misunderstood some key aspect of the mirror neuron story. Mirror neuron “theory” strikes me as an odd mix of interesting experimental results and ambiguous reasoning. Nevertheless, I think the popularity of the mirror neuron idea serves as an opportunity to talk about some ideas that are hard to work into neuroscience writing aimed at a general, non-mathematical audience. People interested in mirror neurons may have intuitively found their way to a problem that computational neuroscientists consider one of the central challenges in our quest to understand biological intelligence: how does the brain detect and create invariants out of the formless and ever-changing sensory raw material available to it? As we shall see, the activity of a canonical mirror neuron displays a kind of invariance — its firing reflects the recognition of an action irrespective of the agent performing the action. First of all, what exactly are mirror neurons? They are supposedly a “class” of neurons that fire when a monkey is performing a goal-oriented action, and also when another individual (human or monkey) is performing the same action. A group of Italian researchers discovered them in the premotor cortex of rhesus macaques . Since these neurons were found in premotor cortex the researchers inferred that they were instrumental in “understanding” the goal-directed action, irrespective of the agent. Some researchers link this “embodied” understanding with imitation, since it appears to be based in the brain areas that trigger motor responses. People often refer to mirror neurons as the basis of empathy, based on the idea that our understanding of other people’s actions and feelings depends on our ability to imitate or emulate the feelings of others. There are two independent lines of research being merged here: (i) psychological studies in humans linking imitation with empathy, and (ii) mirror neuron studies in monkeys linking brain activity with imitation or action understanding. But there are many more connections that need to be made before even hinting at a neural theory of imitation-based empathy. First of all, the evidence for mirror neurons in humans is still being debated. And even if a consensus emerges that they exist as described, we still don’t have a very clear picture of the neural mechanisms linking the processes that are presumably involved in empathy: sensation, perception, pattern recognition, motor control and subjective feeling. Ignoring these and other major holes in the story, VS Ramachandran felt confident enough to assert that mirror neurons were “the driving force behind the great leap forward in human evolution”. I have cited some work that points out flaws in the way the experimental results have been interpreted , but for the purpose of this post, let’s just take the results as given. I don’t deny that mirror neurons seem to be linked to fascinating phenomena, but we should not be surprised at all to find these phenomena reflected in the brain. Where else could they be? So let’s investigate what we already know — but rarely state explicitly — about the human mind-brain-behavior continuum. This will allow us to put the mirror neuron hype in perspective, and perhaps find out where the real scientific puzzles are lurking. Let’s think about a typical goal-directed action — aiming at a target with a bow and arrow. When you see Robin Hood aiming at the target, you can say, “Robin Hood is aiming at the target”. When you see yourself aiming at the target, you can say, “I am aiming at the target.” This is beyond obvious. Now, unless you suspect that language is controlled by the stomach or the pancreas, you already knew — and I am just reminding you — that the concept of “aiming” that you are able to identify in other people and in yourself is somewhere in your brain. I see what you’re doing there! Convinced that concepts are represented somewhere in the brain (either in a localized or distributed manner), we can be reasonably confident that the concept of “aiming” can affect the brain processes that control your mouth, lungs and vocal chords, allowing you to say the word “aiming”, or mirror the action. And it is clear that the concept must be independent of who is holding the bow and arrow. Imagine the alternative. You might call Robin Hood’s act of aiming “trapooling” and you might call your own act of aiming “caduffing”. If you were unable to see the similarity between what you do and what anyone else does, you would be unable to replace “trapooling” and “caduffing” with a single word that describe the action you and Robin Hood were both performing. If we were really plagued by a blindness to similarity between different experiences, we would be unable to communicate about them at all, because our perceptions would be unique and unrepeatable, and therefore private and inaccessible. Language depends on the ability to recognize and categorize things, processes, and abstract concepts. So we can safely assume that some neurons or groups of neurons or patterns of neural activity will appear to be “mirroring”, because they can access your muscles and trigger aiming when you see someone (anyone!) engaged in aiming at a target. And since concepts must have access the motor system, it’s no surprise to find neurons that correlate with them in motor areas of the brain. They would have to affect the motor system at some stage, right? All this becomes apparent when we witness a child learning the meaning of a word. When my cousin’s son was 2 years old he was still slowly figuring out how to use colour words. He would pick up a coloured Duplo block and ask us, “Blue?” If the block was in fact blue one of us would nod and smile, and he would be very pleased with himself. But sometimes he picked up a red block and asked “Blue?” And we would gently shake our heads and correct him. Clearly it took some trial-and-error for him to grasp the meaning of the word. Now how do we know he has understood? We don’t typically use brain scans or mind reading. We infer his understanding from his ability to use the word “blue” in the appropriate contexts. If he can use the word blue only when it’s appropriate, and pick out blue things when they are pointed out to him, most people will happily admit that he has understood the concept of blue. And the same goes for action words like running, jumping and aiming. Even for someone who is paralyzed or in a vegetative state, we infer understanding from the ability to respond to stimuli– to move an eyelid or finger, or to modulate internal brain activity that is detected by a scanner. Very little neuroscience is needed to support the assertion that the brain is central to these phenomena. Neuroscience is really needed to explain how the brain does all this. We still have no idea. If we did, you would be able to teach your smartphone a new board game by just having it listen in while you read out the rules. Humans can make use of far more invariants that the board with the holes. When it comes to shape recognition, the average humans is better than most advanced computer programs. Our ability to detect squares, for instance, is invariant or near-invariant to changes in size, orientation, viewing angle, texture, and so on. And consider how well we recognize other people! You can often spot a person you know even if he or she is far away, in disguise, in an unexpected place, wearing different make-up or sporting a new hairstyle. So your internal representation of that person is invariant with respect to a variety of transformations. Similarly, your internal representation of an action is, to varying degrees, invariant to a change in the agent performing the action, the nature of the goal or target, and the context in which the action is taking place. Thus you can recognize “running”, whether it’s a human running on a track, a chicken running in a field, or a bull running through the streets of Pamplona. And you can recognize “aiming” whether you are doing it or Robin Hood is doing it, so your internal representation of “aiming” is invariant with respect to the change of agent. How the brain facilitates finding and creating this sort of invariance is a major open problem, and is being investigated from various angles by psychologists, cognitive scientists, artificial intelligence researchers, and neuroscientists. 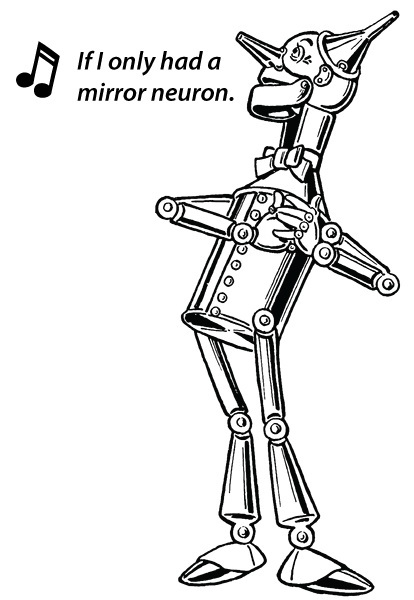 Mirror neuron activity appears to be invariant with respect to a change of agent. This is clearly an interesting experimental finding, and gives us possible physical correlates of a complex psychological phenomenon. But does it deserve all the recent hype? After all, (a) we know from human behavior that the brain must show invariants, and (b) we don’t know how particular invariants arise. Both the hype and the ambiguous reasoning I mentioned before seems to stem from using mirror neurons as an explanation for understanding, rather than a consequence of brain processes that remain to be explained. In popular articles, and even in the technical literature, mirror neurons are starting to sound like magical antennas that pick up what is happening, and somehow “know” that the same goal-oriented action is being performed irrespective of who is doing it. And if you lack these magical antennas, so the story goes, you may become autistic! Neuroscientists often make fun of the idea of the homunculus — a little man inside your brain that sits in a control room and “sees” what you see, “hears” what you hear and so on. The homunculus was dismissed because it simply passes the explanatory buck down one level, forcing us to ask how the homunculus sees and hears in the first place. But the mirror neuron “system” somewhat resembles a homunculus — it does all the hard work of recognizing goal-oriented actions and determining that they are similar in the first place. So the real question to be asked is: how are mirror neurons able to do what they do? Mirror neurons are not magical antennas. The invariants they are able to create or detect must therefore be a product of their intrinsic properties, their inputs, and their interactions with other cells. If they seem like antennas then we must understand how they can “tune-in” to particular aspects of stimuli and not others. It is the goal of computational neuroscience to understand how the great radio that is the brain helps an organism tune-in to various “frequencies” in the world in order to play the music that is its behavior. To do so we investigate the biophysical mechanisms by which the neural networks act together to control the state of the whole body. Simply saying that the mirror neurons “do empathy” doesn’t help much. Here’s a somewhat unfair and exaggerated analogy that gets at the inadequacy of mirror neurons as an explanation of anything. Imagine if physicists explained the elliptical orbits of planets by simply stating that the planets contain innate “ellipse particles” that are predisposed to making elliptical paths. So ellipses are caused by ellipse particles. This would be a useless explanation. On the one hand, we already knew about the ellipses. On the other, the explanation doesn’t tell us anything about how the ellipse particles work. Solving the real puzzle requires understanding how the planets interact with the sun and each other, and how these interactions result in elliptical motion. The task of neuroscience is to understand how interactions between neurons in neural networks allows for mirroring behavior to emerge. And if we want to talk about empathy, we will have to do even more work, connecting sensory signals with perception, pattern recognition and subjective feeling. In the interim we are saying not much more that this: “Mirroring is caused by mirror neurons.” We could easily reverse this, and say “The faculty of mirroring results in mirror-neuron-like firing patterns.” Rather than an explanation of empathy or understanding, mirror neuron theory thus far seems to be little more than a re-description of the phenomena with no added explanatory power. In order to learn the names of new concepts, you must be able to recognize phenomena in the world in agent-independent ways. For example, let’s say you recently learned the name of a particular yoga position — padmasana, for instance. Before discovering the name, you must be able to recognize the position as something that multiple people, including yourself, might be capable of performing. Otherwise when someone points to a person performing padmasana, you will not know what is being pointed to, and therefore will not be able to recognize the concept in other people and yourself. Without this recognition, naming would be impossible. So even though I use language to illustrate this process of mirroring or invariance-finding, the process is “prelinguistic” and seems to form part of the scaffolding necessary for language development. Here are some key problems listed by Greg Hickok (who also wrote the Talking Brains blog post I linked to). As you can see, they are much more specific to the experimental methodology, the specific location where the purported mirror neurons were found, and the relevance of mirror neurons to “action understanding”. This is a highly recommended textbook explaining the concept of mathematical symmetry, and its relevance to science. In fact, Rosen argues very convincingly that science is the quest to uncover symmetry in nature. Star Trek and Tin Man pics courtesy Wikipedia.